Wherever you are in the UK your dog&apos;s Health, Holidays and Happiness are just a few clicks away. 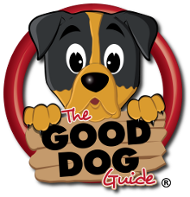 The Good Dog Guide is the UK&apos;s dog friendly information website, designed for all us dog owners and our four legged friends to get the best out of life together. Providing free access to over 20,000 listed businesses and services around the UK and Southern Ireland all within an easy to use directory style website. The website includes informative listings on dog friendly places to stay, eat and visit, local walks and beaches, along with helpful services like dog walkers, home stay hosts, kennels, pet shops, groomers, trainers and so much more. Follow us on Twitter and facebook to keep up to date with our latest news and to share your thoughts! Your comments and suggestions on The Good Dog Guide are always welcome, so please click on contact and send us a message, we would love to hear from you. If you have a dog friendly business and are thinking of advertising with us check our testimonials page for some comments from our advertisers. It&apos;s a dog&apos;s life lets make it a happy one!